Your compilation of search terms used to find The Changeover during the past week. 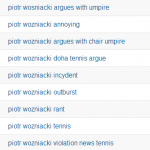 Your compilation of search terms used to find The Changeover during the 2013 Wimbledon. Your compilation of search terms used to find The Changeover during the 2013 French Open. A compilation of amusing search terms used to find The Changeover during the past two weeks, featuring a very scary audit of The Changeover, and some new hot assets. 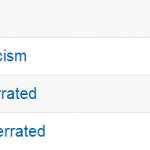 Your bi-weekly compilation of amusing search terms used to find The Changeover. Searching for … The Changeover? Irnis Golbis, Nedal, Jokuvis, The Highest Paid Player, and the World’s Most Handsome Man. Your bi-weekly compilation of amusing search terms used to find The Changeover during the past two weeks. 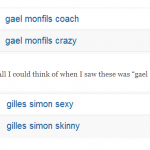 A compilation of amusing search terms used to find The Changeover during the past two weeks.